where is the total resistance of the circuit, and is its self-inductance. Figure 7.5: The homopolar disk dynamo. that is, provided that the disk rotates sufficiently rapidly. Note that the homopolar disk dynamo depends for its success on its built-in axial asymmetry. 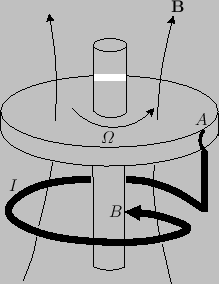 If the disk rotates in the opposite direction to that shown in Figure 7.5, then , and the electromotive force generated by the rotation of the disk always acts to reduce . In this case, dynamo action is impossible (i.e., is always negative). This is a troubling observation, because most astrophysical objects, such as stars and planets, possess very good axial symmetry. We conclude that if such bodies are to act as dynamos then the asymmetry of their internal motions must somehow compensate for their lack of built-in asymmetry. It is far from obvious how this is going to happen. Incidentally, although the previous treatment of a homopolar disk dynamo (which is the standard analysis found in most textbooks) is very appealing in its simplicity, it cannot be entirely correct. Consider the limiting situation of a perfectly conducting disk and wire, in which . On the one hand, Equation (7.105) yields , so that we still have dynamo action. But, on the other hand, the rim of the disk is a closed circuit embedded in a perfectly conducting medium, so the flux freezing constraint requires that the flux, , through this circuit must remain a constant. There is an obvious contradiction. The problem is that we have neglected the currents that flow azimuthally in the disc: that is, the currents that control the diffusion of magnetic flux across the rim of the disk. These currents become particularly important in the limit . as before. Note, however, that as . In other words, if the rotating disk is a perfect conductor then dynamo action is impossible. The previous system of equations can be transformed into the well-known Lorenz system, which exhibits chaotic behavior in certain parameter regimes (Knobloch 1981). It is noteworthy that this simplest prototype dynamo system already contains the seeds of chaos (provided that the formulation is self-consistent). The previous discussion implies that, while dynamo action requires the resistance, , of the circuit to be low, we lose dynamo action altogether if we go to the perfectly conducting limit, , because magnetic fields are unable to diffuse into the region in which magnetic induction is operating. Thus, an efficient dynamo requires a conductivity that is large, but not too large.